I wanted to do something a little different that I hope is helpful to people. Mods, feel free to move this thread somewhere else if needed to. My apologies for the picture quality. Blame Steve Jobs. For yesterday's game, I bought tickets in the AT&T Sports Deck (SD for the rest of this post). I had some questions about it before the game, but there didn't seem to be a full review of it anywhere, other than a paragraph on Trip Advisor. Thus, here it is. Price: We paid ~$150 per ticket on StubHub the day before the game. Of course, they added 20% in fees. The "classy" experience starts at the entrance. Rather than wait in line with all the commoners, there is a separate set of metal detectors for those in the premium seats. Truthfully, it didn't move much faster than the regular line, but it made us feel special. Well, not really, but you get the point. The SD is located all the way at one end of the stadium. 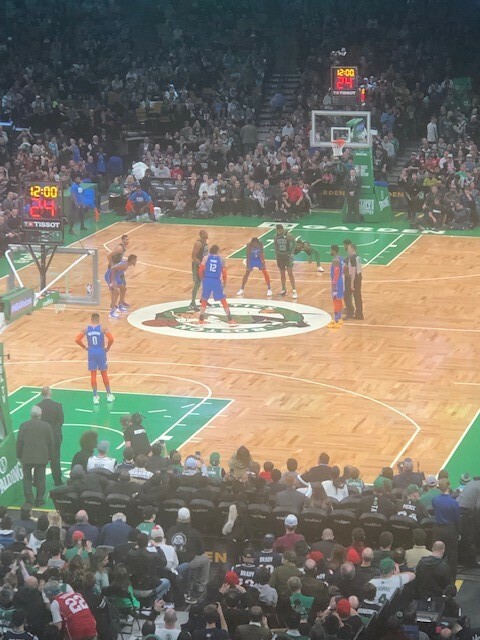 I can never remember whether it's the north or south end, but it's over the basket that the Celtics usually shoot at in the first half (same side as the benches). It's on the fifth level, which is only accessible by a really slow elevator. 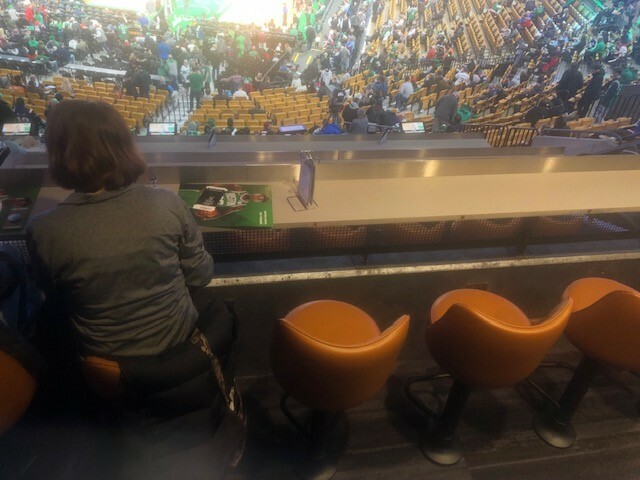 There are also suites and a small "Celtics museum" on the level. Outside, there are three or four food vendors, with higher-end food than you would typically find downstairs (in addition to the traditional stuff). You probably won't need them, though. There are also reserved bathrooms for the level, although they still get busy during intermissions. The SD is just off the elevators through a pair of glass doors. You must have SD tickets to enter and they'll give you a bracelet once you do so, which will let you come in and out without checking in. There are four rows of bar stool seats, although you can also buy SRO tickets. I was a bit nervous about how high up we are, but the view of the game was quite good. We were in the fourth row. There are about nine seats in each row and they're packed pretty tightly together. Instead of climbing over people to the side, it was better just to scoot backwards and step out. There is a giant pole right behind Row 4, Seat 7, which impedes your ability to move backwards. Guess how I figured that out. Most rows, though, seemed to have a few unoccupied seats, which allowed people to move around and create space for themselves. We got there about an hour before the game and were among the first in the section, so we were able to grab food right away. As more people showed up, it got a little busier, although there were food stations (same food at each, with the exception of the clam chowder, which was only at one end) at either end of the section. When there were a bunch of people going for food at the same time, it got a bit tight, but was never really an issue. They did tend to run out of the hot stuff frequently and the staff was constantly running back and forth to bring trays of food. 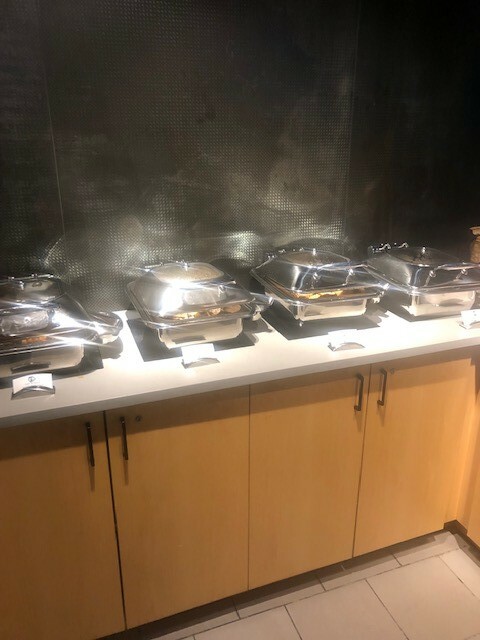 Note: They take the food away at halftime. Quality? Just like mom makes, if mom were cooking for 16,000 people. It's a ball game, not Per Se. 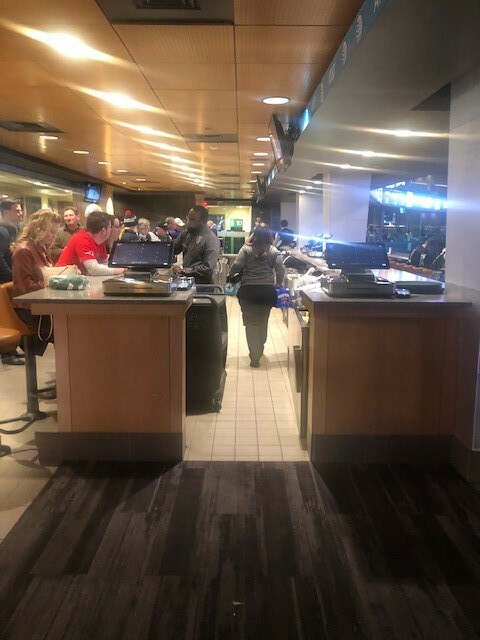 The bar was in the center of the action, although you could also have drinks delivered to your seat. They could definitely have used an extra bartender there to move things along, but everyone working there was extremely friendly. They also had big TVs over the bar, which meant that I paid $180 for my kid to spend half of his time watching the Bruins game. You're pretty high up, but the view is still very good (I tried to zoom my camera to give the same impression as what I saw.). Naturally, of course, we were still able to see every Oklahoma City foul that the refs missed. Depending on where you are sitting, you may have an awkward view of either the scoreboard or the electronic statistics boards that are located on the balcony levels. 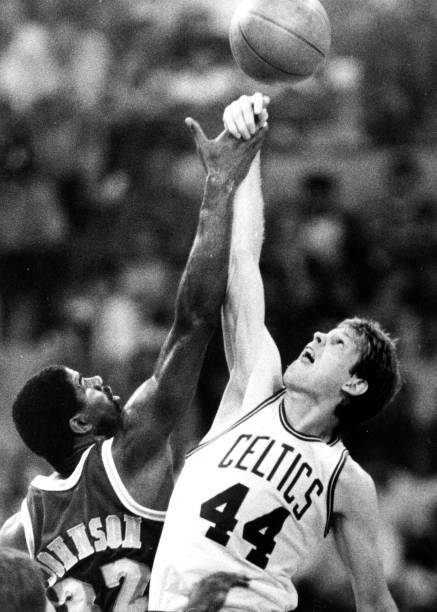 For instance, we had the corner of the Jumbotron facing us, so we had to twist a little to see the player statistics. 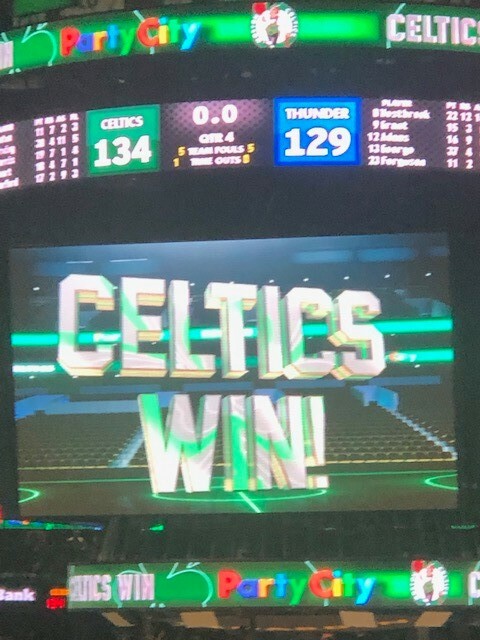 Also, the Jumbo obscured our view of the electronic data, which means that we could see OKC's team statistics but not the Celtics'. Nothing serious, though. If you are in the first row of the section, you have a little TV at your seat. Never found out what it was for. The crowd was pretty much 20 and 30-somethings, although we were not the only family with a kid, either. Although the alcohol flowed pretty freely, it was definitely NOT the obnoxious drunk section. 1. Once you're up on the fifth level, you're kind of stuck up there. There are escalators going down, but none coming up, which means that you have to wait for the elevator if you want to get back. That elevator is really, really slow. 2. Depending on where your seat is, your view may or may not have a few minor scoreboard obstructions. Nothing at all serious or that can't be solved by twisting your head. Oh, also, if you're in Row 4, Seat 7, you'll have a giant pole behind you. 3. The seats are packed in pretty tight. It would help the comfort level if they took out one in each row (which, of course, they can't really do, since those seats have been sold). Awesome post. I'd love to see more of these seat reviews. They're a great service for fans. Funny you mention. I bought a 10 game premium package this season in that very same location. My seats are in row B, seats 45/46, section reserved in the AT&T sports deck. 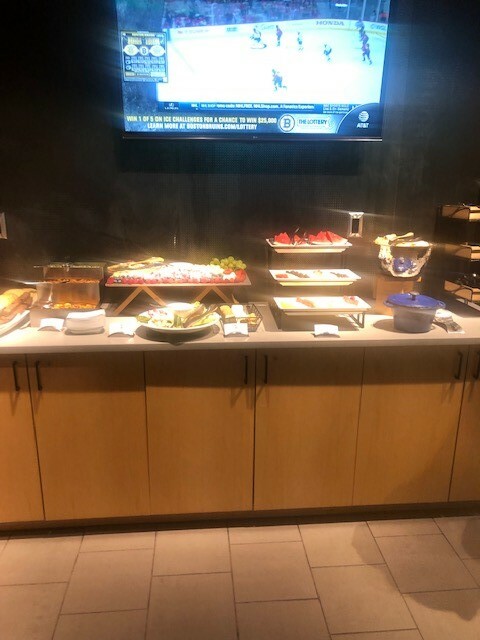 The pros (as you mentioned): They have a spread with free food for all fans in that section, which is great. Also, the soda at the bar is free. Btw, I was also at the game yesterday. Also, last week after the Warriors game, I experienced a horror story trying to find my truck because there literally wasn't an elevator to bring me to the floor I was parked on. I'll just leave that alone and hope it never happens again. Hope this helps for anyone ever interested in buying seats to this section. I do recommend it. I am going to the game tomorrow in Cleveland, for the first time not sitting all the way in the back. Going to be on the 12th row from court (thanks to a friend) super excited! I've sat in this section before (7 or 8 years ago) and didn't care for it other than the free 'buffet style' food. I didn't find the experience worth it for the cost, especially since the seating isn't any more comfortable than the rest of the regular seating areas. I also don't like sitting behind the basket, if avoidable, and would never pay a premium for it. Enjoy! They'll probably be more Celtics than Cavs fans. EDIT: Guess Kyrie isn't playing tomorrow because of another hip injury. Should still be a good game and a win for the good guys. Understood. It's not for everybody. I'll let you know next time I'm up there and buy you a bratwurst (or whatever else they are giving away for free). We had three, myself, my brother and my 10-year old. It was great seating for everyone. Glad you guys liked it. The Cuban paninis were pretty good.